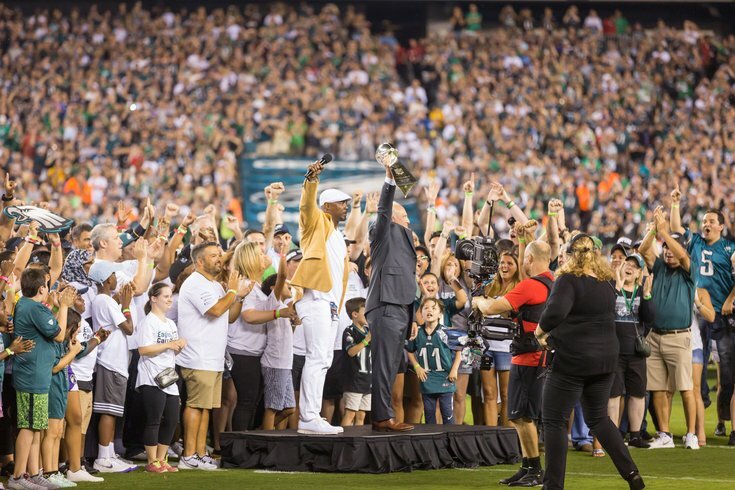 Brian Dawkins and team owner Jeffrey Lurie celebrate before the start of the first game of the 2018 season in an on-field rally. According to Eagles' great Brian Dawkins, perhaps a "Super Bowl hangover" is a good thing. In losing three of five games to start their title defense, many Eagles fans were dismayed and fearing the team's best days were behind it. Dawkins says it could be just what the doctor ordered. "This is gonna sound crazy but I'm so glad they lost some games early. I really am," said Dawkins, the NFL Hall of Fame safety who is in Philly to be honored at halftime of the Birds' Week 7 game against the Panthers. "Because in those losses you can really have tough conversations ... especially when you lose two games in a row." After inching out an opening night win over the Falcons, the Eagles lost winnable games both in Tampa and in Nashville before faltering against the Vikings in Week 5. In those first five games, the Eagles could have just as easily — with a different break or two — have been 0-5 or 5-0. "Losing those close games —you should have won those games — and now you can really learn, not only to hold one another accountable, but to hold yourself to a higher level of accountability. You can have those tough conversations. You have a chance to learn who you are. This nucleus, this new team, there's some new faces there and you get to see how those individuals hold themselves in tough situations." Dawkins went through a similar situation during the team's run up to the 2005 Super Bowl. Undefeated heading into Week 9, the Birds laid an egg against the Steelers in a 27-3 defeat in Pittsburgh. The following week, Philly beat Dallas 49-21 and ran off six straight wins to clinch the top seed (before eventually losing to the Patriots in Super Bowl XXXIX). "Now everyone really gets a chance to learn who they are so they can hopefully build something," Dawkins, who has officially left the Eagles' front office but left the door open to return as a scout, or in some other capacity next year. "We all hope that game against the Giants [a 34-13 win in New York last Thursday] showed they got through those things and hey can get on the road to winning." The Eagles host the Panthers Sunday afternoon then face the Jaguars in London before their bye week.